Cistus x hybridus is one of the hardiest cistus in cultivation, but still needs a little protection, say, from a fence or a wall. It forms a dense evergreen bush with wavy edged dark green leaves, which may feel sticky to the touch. It can grow to 1m tall and 1.5m wide. Its crowning glory is its extravagant white flowers its white petals surrounding a central boss of yellow stamens (the male reproductive organs producing pollen containing anther and filament). Each flower may only last a day or so but they are produced in such abundance that the shrub is in flower through June and July. There are many cistus in the Gardens. Cistus ladanifer, in the Herb Garden is of particular interest as it is known as the ‘Gum Cistus’ This ‘ladanifer’ or ‘landanifer’ gum is a much sought after ingredient in perfume. The gum apparently collected on goat’s beard’s at the time of Pliny, is an alternative to ‘ambergis’ which is no longer used as it was collected from sperm whales, which are an endangered species. It has large white crinkly flowers. There is also a bank of cistus flowering well opposite the Growing Schools Garden. Here can be seen white flowers with purple or yellow blotches or pink flowers. 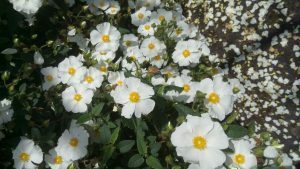 All cistus require poor soils which drain well and need a lot of sun shine to grow well. They should not be fed and can be relatively short lived, so make sure you take cuttings. These can be softwood (fresh growth that is not hardened) or greenwood (very green and young) in summer. Cuttings should be no more than 75mm long from non-flowering wood, and placed in gritty, free draining compost.